Four Star Cabin on Quiet Bass Lake: Now Booking for Summer 2019! Cabin, 2 Bedrooms + Convertible bed(s), 1 Bath. This cabin was completely remodeled in 2008 to create a four-star hotel quality feel, tucked in the north woods on Bass Lake near Traverse City. The beds and linens are extra comfortable and cozy. 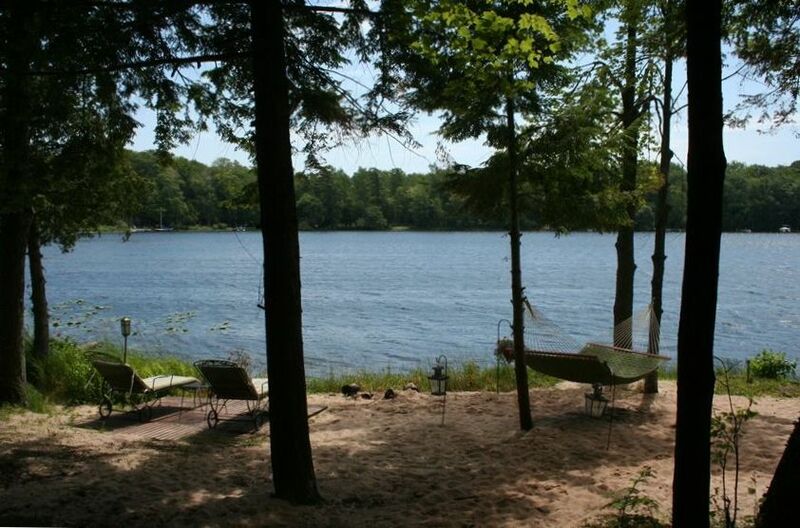 The cabin is part of a quaint resort on 5+ acres with 700+ ft of lakefront. Feel free to relax and have a fire on your own private beach or use some of the shared amenities on the property including great fishing spots, sandy recreation areas a large fire pit and the deck dock. This cabin is one of a few remodeled and available for rent as well for larger groups. Our favorite activities are fishing from the dock or row boats (available for rent), swimming, water skiing, tubing, and going to Boones Long Lake Inn 'Big Deck' for live music, cocktails and great food which is less than 2 miles away. Famous Moomer's Ice Cream is just down the road near long lake for dessert. Our home golf course is 'The Crown', located about 2 miles from the cabin. Of course, in the Traverse area, there are no shortage of things to do or places to see. My name is Mike Olson. I grew up in Traverse City and now live in Illinios. I enjoy spending time at our cabin with my wife and two kids, ages 17 and 18. I am an information technology professional that travels quite a bit. So far, I've been able to commute out of the Cherry Capital Airport during the summer and spend a lot of time at the lake. My wife spent her summers growing up on Bass Lake with her family. Now, several family members own property on the lake including the group that bought this old resort with us. We love being so close to town, and yet looking out on such a seren setting. The kids really enjoy seeing all the wildlife including a family of turkeys, a family of deer, loons, foxes, and all the other Northern Michigan wildlife. I enjoy fishing for bass or just taking the kids out to fish for bluegills. The evening boat rides around the lake are great, and we waterski every chance we get. Once a week or so we head over to Boones and have dinner on the big deck while enjoying a local singer play some tunes. The beach area that is seen in the photos is private for your use only. We do offer a shared dock and beach area 4 cabins down. Such a beautiful location! We came looking for fall colors and we found them! So close to everything yet so private and secluded. We loved this little Bass Lake cabin! We rented a stand up paddleboard for the week and enjoyed paddling around the lake. The house had just enough space for our family of four with kids ages 11 and 14, especially with the hammock and fire pit seating outside near the lake. During the week that we stayed here, we went into Traverse City several times, drove to Sleeping Bear Dunes National Lakeshore for hiking, a beach walk, and tubing on the Platte River, and took a longer day trip to Mackinac Island (about 2.5 hours away, but so worth it!). The Michigan cabin was everything we hoped it would be - secluded, peaceful, and just enough rustic, but with the amenities we needed. It was meticulously clean with a well-appointed kitchen and comfortable furniture. We were greeted with local treats. The owners were great and very responsive. A couple of things to pass on: there is no oven, but there is a nice gas grill, so plan your meals accordingly. The master bedroom doesn't quite close all the way. This was no problem for us, but you might want to know it. We were so sad to leave and would stay there again in a heartbeat if we find ourselves in the area. This place was just about perfect for a quiet autumn week. While other nearby lakes looked like suburban subdivisions with modern homes and mowed lawns, this really did feel like a place in the north woods. The cabin and the ones around it have an old-timey feel, but inside, it's updated, modern, and very comfortable. We enjoyed having the stretch of lakeshore, and seemingly the whole lake, to ourselves during the week (this was early October). The feeling was lost over the weekend though, as a large group rented several cabins on either side of ours and stayed up til 2 each morning - but that's not something our cabin's owners could control. Cozy Cabin with 1940's Chic! After many years of vacationing "Up North", we finally found a location that is excellent in terms of access to all of the wonders that the Traverse City area offers. Kathy and Mike's camp provides a laid back and relaxing atmosphere to an already excellent vacation venue. They were always available if needed and quick to assist if necessary. Bass Lake is fantastic for kayaking, SUP boarding and all other water sports. Also quite the treat to relax on their big hammock and take in the views. We would not hesitate to return here in the future! Our stay at Kathy's cottage on Bass Lake couldn't have been better. It was exactly as described with a beautiful cabin and view of the lake. We had everything we needed for a comfortable stay during our time there, and Kathy was very helpful in answering any questions that we had in a timely fashion. I would recommend to anyone looking for a great place to stay for a very reasonable price in this region. You are only 10 minutes away from beautiful downtown Traverse City. With a short drive to Sleeping Bear Dunes and multiple Vineyards for a day of wine tasting. My only regret is that we couldn't stay longer during our vacation.